I have a new slow cooker recipe for you! This time it’s slow cooker ratatouille soup. One can never have too many soup recipes right? Especially when they are healthy soup recipes. Even better if they are slow cooker recipes. 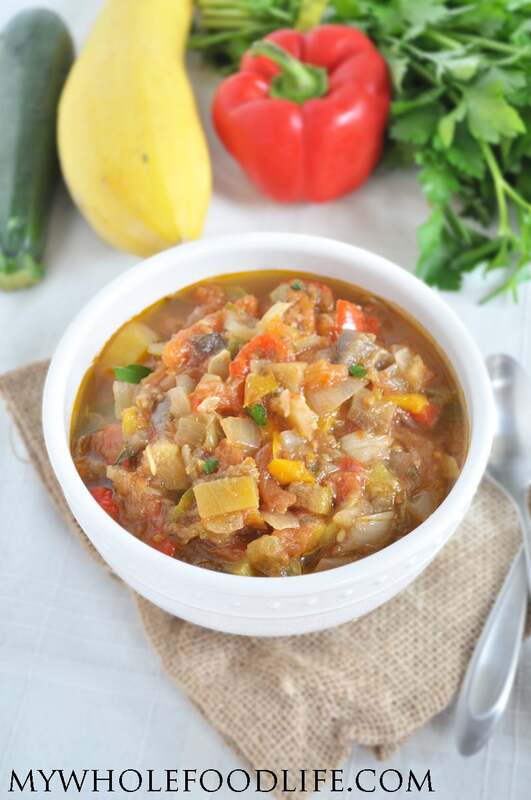 This slow cooker ratatouille soup will not disappoint. It’s loaded with flavor. I hope you enjoy it as much as I did. If you wanted to add more protein to this soup, I could see white beans or kidney beans going real well in here. This soup is great on it’s own though. Plus the house will smell amazing! Unlike most soup recipes, this one contains no broth. Most of the vegetables release so much water in the cooking process, that there was no need for broth. This recipes makes a very large amount of soup. It’s quite budget friendly. I store mine in serving sized containers in the freezer for easy meals on those busy days. A healthy and comforting slow cooker soup! Throw everything in a slow cooker and cook for at least 6 hours. Cook on high for the first hour and then turn down to low for the remaining hours. Feel free to cook it longer than 6 hours if you like. I think the longer a soup cooks, the more the flavors develop. **To peel the tomatoes, core them and and place them in a saucepan of boiling water. After a minute or two, pull them out and place them in an ice water bath. The skin should easily come off. You can try leaving the skins on for this soup, but they may get tough while cooking so long. Don't throw the skins away though. You can save them with all your other scraps for homemade vegetable broth . Enjoy! Is it an ad popping up? That should NOT happen. I'm a little confused, does this need water or broth? Because normally soup has that, right? So no water needs to be added at all or cover it with water? Thanks. No. The eggplant will release so much, that you don't need to add extra liquid. So my grocery store didn't have eggplant so I'm using mushrooms instead. Do you still think this is ok without water or broth? I would add a little broth if you are not using eggplant. can you make this without oil? or with a nonfat substitute? You can probably just omit it. I HAVE to try this. I love making my own sauces/dressings/anything I can from scratch. I always thought broth was more labor intensive. This is super easy, but it's soup, not a broth.